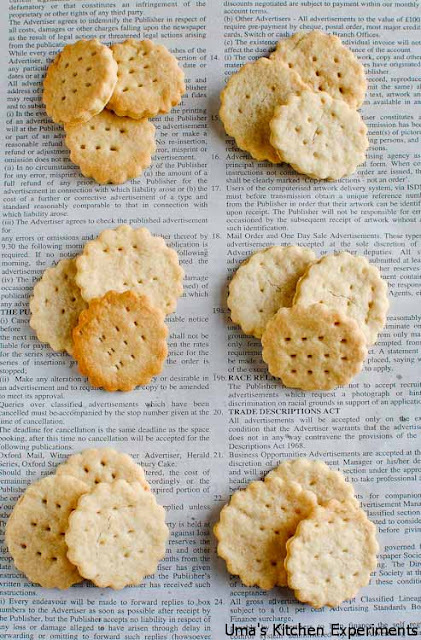 I really want to write my experience when I baked these Ritz cracker. but it is already late night here and it is been a week since I updated my blog. So I am jumping to the recipe directly to day. This recipe is adopted from spicy treats where she adopted it from Cupcake project. 1) Preheat the oven to 400F. Line the baking tray with the baking sheet. 2) In a mixing bowl, mix flour, baking powder, sugar and 1/4 teaspoon of salt. Mix well till all the ingredients are incorporated well. 3) Add cold unsalted butter to the mixing bowl and mix well. 4) Next, add oil and mix well. 5) Now, Start adding water slowly / little at a time and mix the flour using your hand. Add water till you get a smooth dough. 6) Very slightly knead it and divide into medium sized balls. 7) With the help of flour, roll out each medium sized dough balls as thin as you can. 8) Using a cookie cutter cut the dough. Use any of your favourite shaped cookie cutter. 9) Arrange them in baking tray. Repeat this step for remaining dough balls. 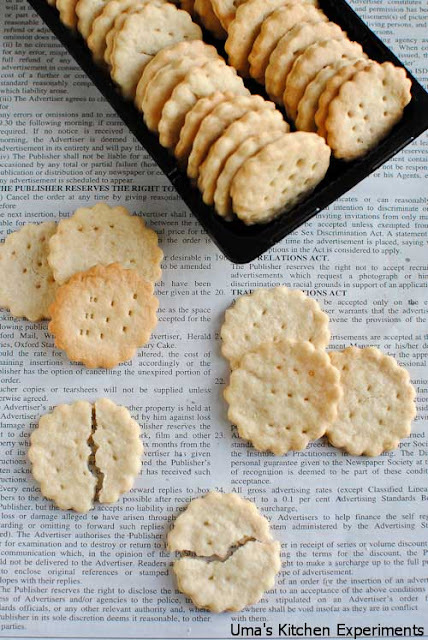 10) Using a fork, make holes in each of the ritz pattern. Putting holes in the cookie helps the cookie to bake correctly. 12) When cookies are in the oven, melt the remaining butter and mix it with salt. 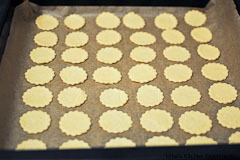 13) When the cookies are out of oven, brush them immediately using the melted butter and salt mix. I skipped this part and added more salt while making dough. It is up to you to prepare your preference. 14) Cool slightly and enjoy with tea. I did not realize that it was this simple a recipe to make. 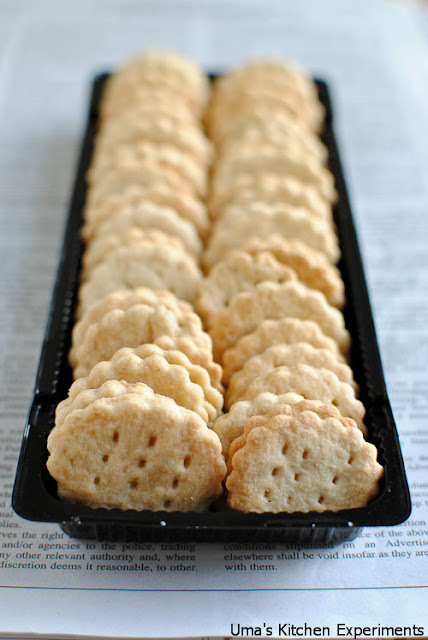 I always buy boxes of ritz crackers for snack. Thanks for sharing this recipe. 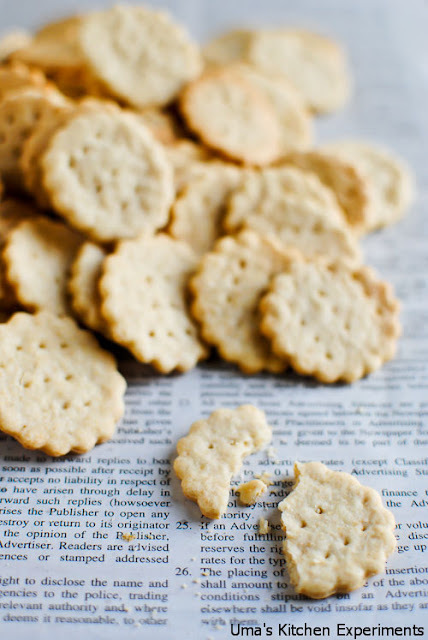 Crackers look so delicious and crunchy. Yummy preparation. looks crispy and very tempting uma. Wow... never knew these beauties can be made at home this simple way... Great Job Uma!! Cute crackers,feel like munching some..
Just made this yesterday. I used white whole wheat flour and just a teaspoon of sugar. They turned out great. I will definitely make them again. I did get 70 crackers out of one batch so I must have rolled them out a little thinner? Thanks for sharing! Thanks Amy for trying it out.